Louis H. Campbell, 71, lifelong resident of New Haven, entered eternal rest on November 14, 2018 in Port St. Lucie, FL. He was the beloved husband of Judith Campbell. Mr. Campbell was born in Vanceboro, NC on December 30, 1946, a son of the late George Sr. and Maggie Campbell. Prior to retiring, he was employed by the City of New Haven Board of Education as a Truancy Officer. 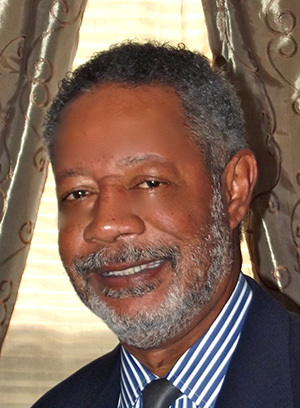 During his tenure at the NHBOE, he served in many community liaison positions including Juvenile Review Board and as the head of Grandparents on the Move in New Haven. Louis served honorably in the U.S. Army Reserves; was a longtime member of the former St. Andrew’s Episcopal Church in New Haven; a member of Omega Psi Phi Fraternity; Widow’s Son Lodge No. 1 F. & A.M.; and East Rock Lodge No. 141 I.B.P.O.E. In addition to his wife, he leaves to cherish loving memories, a daughter, Andrea Murrell (Anthony M.); a niece “daughter,” Nakia Dawson-Douglas (Marquis); grandchildren; Campbell, Drew, Anthony, Kennedie and Xavier Murrell; a brother in-law, William Dawson; and a host of nieces, nephews, other relatives and friends. He was preceded in death by brothers, Robert and George Campbell, Jr.; and a sister, Burnestine Campbell-Dawson. A Requiem Mass to celebrate Mr. Campbell’s life and legacy will be held Saturday, December 1, 2018, at 9:00 a.m. at St. Luke’s Episcopal Church, 111 Whalley Ave., New Haven. Burial will be in Beaverdale Memorial Park. Friends may call at the church Friday, November 30, 2018, from 5:00-7:00 p.m. Fraternal services will begin at 6:00 p.m.
Judy and Andy may the lord comfort you and your beautiful family in your time of sorrow may peace and blessings be with you. We are saddened to hear about the passing of your Beloved Louie. May God provide you with His Love and Mercy at this most difficult time. I was so saddened to hear of Louis’ passing. My prayers are with you during this difficult time. My deepest sympathies to the family. Lou was truly my brother. Always a source of sage advice and counsel. I loved him dearly and will miss him. My sincere sympathies to you and your family at this most. difficult period. Out of suffering have emerged the strongest souls. Fondest memories of Lou and you. We were shocked to hear of Lou’s death. We will be at a family funeral in Pennsylvania this Saturday, but we will be with you in spirit. You are in our prayers today and always. Sincerest condolences are extended to the entire Campbell family.Remember Earth has no sorrow that heaven cannot heal. My deepest sympathy and heartfelt condolences to you and family. Rev. Meadows, Michael and I wish to express our heartfelt sympathies to you and your loved ones. You are indeed a remarkable family and grateful for our kinship to the Campbell Family. We especially trust that God will continue to cradle and comfort you all during this season of bereavement. We thank God for Lou’s demonstrated faithfulness-his caring demeanor, always! Our family fondly remembers Lou for his devoted stewardship, kindness, hospitable spirit and sweet friendship. Our love and support will always be here for you. Joe and I were so saddened to hear of Louis’ passing. Sorry, we cannot make it to CT to give you a hug. We will continue to keep you in our prayers. My condolences and prayers are with Judy, Andrea, Family & Friends. I was so saddened when I learned of the passing of Lou and offer my deepest sympathy to you and your family. We were friends and colleagues and I always enjoyed talking with him and sharing our “war” stories and strategies for success! I so regret that I will be out of town this week-end and unable to attend his Homegoing Service. May God give you and your family strength during this most difficult time. I pray that God will wrap His arms around you and give you comfort and peace. May you always remember you will see each other again as death is not final for those who believe. So sorry to hear of Mr. Campbell’s passing. Love and light to you both. May God Keep You In His Loving Care During Your Time Of Bereavement . Sending Healing Prayers And Comforting Hugs. You Are Continuously In Are Prayers. I am so sorry for this loss to you and to our community. May God soothe your heart and grant you His peace. I will continue to pray for you all. Judi, do a rewind and cherish all the many memories. Friendships may fade yet never forgotten! I have many fond moments. Louie is at peace and out of pain. You and Andy hold each other up, while you smile and reflect upon God’s blessing of having him in your lives for so many years. We are there in spirit lifting you in love and regret we cannot be there in person. Love to all. Suzanne (Sue), James (3B), and Melissa Brown (Hall) Orlando, Florida. Our sympathy goes to you and family during these times. May happy memories embrace you now and the future. May his soul rest in PEACE!! Maureen and I wish to express our heartfelt condolences to you and your family. We will always remember our wonderful years as neighbors on Sheffield Ave. Louie was a dear friend, fraternity brother and community servent. We are praying for your comfort and peace. My condolences to you. I will always remember all the great times with you and Uncle Louis! Judy, Andrea and family, Sending condolences and love on the passing of Lou. May he rest in eternal peace. My sincere and deepest condolences to the Campbell Family. Lou was a great man and will be deeply missed. The God of all comforts be with you during this transition. Judy, Andrea and the entire family have my deepest, heart felt sympathies on behalf of myself and my family. Those we love can never be more than a thought away, for as long as there’s a memory they live in our hearts to stay. My heartfelt condolences for the loss of your beloved, Louis. Please know that Jehovah God and his son Jesus Christ is of your pain and they care for you. (2 Corinthians 1:3,4) . I hope that you are able to find some comfort in God’s promise of paradise where there will be no more pain and sorrow (Revelation 21:4,5) and the many wonderful memories of your loved one becoming a reality in the future resurrection in paradise. (Acts 24:15). Please accept my sincere condolences. Our condolences and prayers from my family your family your 1st Cousin Junior. Dear Judith we are loss for words when we heard of Louie passing, we were the couple who help with the st Andrews day care center as u know Louie was always saying how much he appreciate us doing such great job, he was always so nice and uplifting he would always comment about cleaning the day care behind the little people. May God continue to bless u and your family palmer family hamden ct. Please accept our sincere condolences during this very difficult time. Your family is in our prayers. So sorry to hear about my frist cousin passing he will be missed,my condolenes. I was truly saddened, when I learned about the death of Lou. My deepest sympathy to you and your family. I will always remember our days as colleagues that, I shared with the two of you. Judy you know how sorry I am to hear this, sorry I am just finding out. You know my prayers and love are with you and the family .